1. Say whatever you want. I'm not a censor. I'll even usually reply. I bring this up because sometimes I get comments that do sit in the box for a day or two. The reason behind that is usually because it's a piece of information that is interesting or relevant and I want to examine it, and the comment inbox is a safe place to store it so I don't forget where it was posted and then lose it. 2. That being said, comments are still moderated. This means I have to hit a button that says 'publish" for your comment to show up. Why? Because I get way too many spam comments. Spam I will censor. Pretty much anything else is fair game. Here's a good spam comment that showed up right after I posted this: "I'm impressed, I have to admit. Seldom do I encounter a blog that's both educative and engaging, and let me tell you, you've hit the nail on the head. The problem is an issue that too few people are speaking intelligently about. I'm very happy I came across this during my hunt for something relating to this. Also visit my blog legal amphetamines"
See what I mean? There has to be some sort of comment generator these idiots are using, because I'll get the same one multiple times with the only difference being the website they want you to visit. They're smart about it too, they only post on older articles, very rarely the most current feature. Anyway, I assume nobody really wants legal amphetamines. Although it'll be interesting to see what the words legal amphetamines do to my incoming traffic for the next few days. I wonder if anyone monitors websites looking for the words legal amphetamines because I'm relatively certain spam comment websites are not really pointing you to legit legal amphetamines. There might be a search engine designed to find the phrase legal amphetamines on websites to track people who are after said legal amphetamines. Fun over, on to the news. Well this should be self-explanatory. The contract doesn't have to be fulfilled until about this time next year, so there's no rush. You do have to wonder why Russia is still dragging their feet, though. If you're trying to avoid the West going in and screwing up one of your export markets, why would you present them with what amounts to a "bomb by this date" ultimatum? This may be the result of Russia both wanting to finalize the deal, while at the same time giving the West time to think about what blowing up a Syrian S-300P series site would mean. Because it'd probably be host to Russian advisors and trainers for 6 months or so after delivery, you know. It could also be that Syrian crews just haven't started training or completed the training course yet. In which case delivering the systems would make them amount to really expensive bombing targets. Speaking of which, Israel is still barking about blowing the things up if they're delivered because of the threat. I.E. the Syrian IADS would be credible for the first time since about, oh, 1986 or so. What I still want to know is what happened to their countermeasures that they were so sure would defeat an S-300P series system? If the system represents no real threat (and assuming they haven't drank whatever the Turks did in the 90s), why go to the effort of locating and striking them, especially if you're blatantly risking irritating Russia in the process by potentially killing Russian nationals? Isn't it better to sit back and laugh as Assad spends himself into a hole? Wait, I know. Clearly Russia upgraded to Windows 8, rendering the Israeli electronic countermeasure and intrusion stuff irrelevant. France claims that analysis proves that sarin gas, which is a chemical weapon and therefore a WMD, was used somewhere in Syria on more than one occasion. And of course France isn't telling which side used the stuff...which was what I was going to say when the first report came out and they weren't talking. Now, however, they're claiming that it was Assad's forces and/or regime supporters (diplomat speak for Hezbollah). Said claims conveniently being made as I was in the process of typing here. Stupid media. If they're not blowing things way out of proportion, they're being inconveniently timely with their reporting. Well, now we're really going to see what the "proper" interpretation of terms like "game changer" and "red line" is, aren't we? Not that I do or don't think we should be bothering with the non-Assad guys (like I mentioned in another post, supporting such types has worked out so famously for us in the past...), but if I say there will be bombs if you do X, and you go and do X, then it can be argued that there should be bombs. Otherwise why should anyone take me seriously? Not that I'm sure anyone should in the first place. Probably shouldn't take me seriously either. Iraq: mythically overrated by the media, massively bombed twice. Syria, Libya, Iran, and the DPRK were all advised to take notice, given their reliance on the same supposedly mythical yet in reality old-technology weapon systems for air defense. Looks like Syria is learning the lesson that Iran thinks can be solved by welding together oil cans. Buk-M2E systems, Chinese JY-27 and Type 120 radars, and now, by 2014 apparently, some variant of the S-300. Most likely the S-300PMU-2, the current production export model of the P series, although I could make an argument for the S-300VM for added ATBM capability against Israeli weapons. This is the Russian government enacting a new type of "missile diplomacy", wherein they deploy their own or supply modern system components to someone else to ensure that the West stays out of some given situation/gets a message/etc. And you know what? Can't blame them for it. The last time I checked, the S-300P was not a Kalashnikov or shoulder-fired SAM, and therefore not on the UN Arms Control Register. Nor is it typically part of any sort of arms embargo, of which Syria is not under anyway. And, despite ridiculous Turkish theories, the weapon is not a credible surface-to-surface threat. So there is no reason for the sale not to proceed, unless of course the West really does have designs on entering Syria and sorting things out in the manner that it wants them sorted out. And if the EU can decide it's OK to sell weapons to the anti-Assad crowd in Syria, they've got no real leg to stand on when Russia actually conducts a formal, legal transaction on the state-to-state level. Although in the EU's defense the idea of supporting a rebel force with light arms has never, ever blown up in anyone's face down the line. If you ask me, this will either 1) force the West to run in half-cocked without taking the time to think things through and end up creating a bigger mess in the long run (which we arguably did in Iraq despite having said time to think about it first), or 2) make everyone back off while the situation, uh...basically solves itself. Harsh? Yup. But look at it this way. Either the world wants/needs external actors to intervene in the internal affairs of states when things go awry, or it doesn't. That's the question: should we intervene because Assad is a bad guy? Should we stay out of it because it's a situation precipitated internally by internal forces? That's a whole different argument, which isn't the point here. Or maybe Russia really does want us to intervene. Because if the West does eventually go in there after the missiles are operational, Almaz-Antey will be able to sell them for a billion dollars per unit with all of the publicity they're going to get. Or maybe this is all a really convoluted ploy to get Israel to bomb Syria again, claiming that sophisticated weapon systems that Hezbollah would not be able to operate or maintain in a million years are being...transferred to Hezbollah! Really. Buk-M2Es for Hezbollah? That was the best argument they could come up with? Now this is interesting. Saudi Arabia procured the DF-3A in the mid-80s, and signed the NPT in 1988 to assure the US government that no, they weren't trying to go nuclear (although allegations of Pakistani and Iraqi nukes were made for years). Now, with the Kingdom starting to be wary of Shi'a Iran's nuclear (alleged) ambitions, they might be reconsidering the world's most fatal mushrooms. And replacing the DF-3A as the potential launch platform. The difference is that with the DF-3A, they had an inaccurate IRBM basically useful for nuclear warhead transport through the atmosphere. The DF-21 is far more accurate, terminally guided in some versions, making it useable as a conventional strike weapon where the DF-3A is really not. The nuclear weapons acquisition is the best part of the story. If they go this route, then they're breaching the NPT, provided they don't withdraw first. If they don't withdraw, prepare for much hilarity as Iran and its supporters raise hell about the double standard. Because you don't really think we'd actually sanction the almighty oil supplier, do you? For more on Saudi, the DF-3A, and associated information, my next JIR article will be on this very topic. Yeah, I'm not linking to that. If you want a good laugh, go find the pictures yourself. But this is why nobody takes Iran seriously: they abuse the idea of deception to the point where all it does is make us laugh. Plus, their supposedly legitimate programs are also either 1) abused by deception, or 2) just hilarious. Remember the lawnmower engine powered "stealth" flying boat things? The photoshopped missile launch salvoes? The welded together oil cans allegedly holding SAMs inside? This one beat all of them. Iran: demonstrating a lack of aerodynamics, LO design, and cockpit ergonomics all at the same time! Although, we really should've figured the first one out when their crowning aeronautical achievement was putting a second vertical fin on an F-5. -Where are Venezuela's S-300VM systems based? Their Pechoras? In July of 2010, various media reports indicated that Russia was completing a sale of S-300PMU-2 Favorit (SA-20B GARGOYLE) SAM systems to Azerbaijan. Something of an uproar ensued, with Russia and Azerbaijan denying the sale and Armenia expressing its displeasure. Then, in June of 2011, two S-300PMU-2 TELs appeared in an Azeri military parade in Baku. Clearly the sale had gone through, despite the denials from all parties involved. 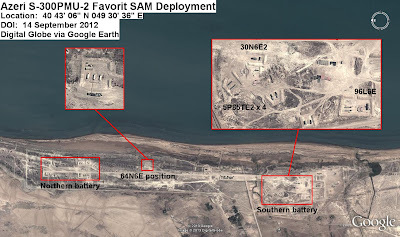 Now, following an imagery update in May of 2013, the location of Azerbaijan's Favorit SAM systems can be disclosed. 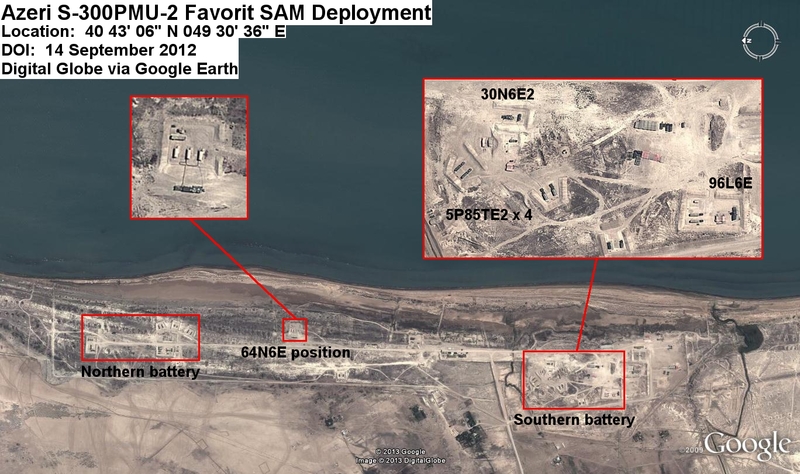 Sited on the coastline northwest of Sumgait, the Favorit batteries appear sited to defend the capital area. The 200 kilometer range of the Favorit's 48N6E2 (GARGOYLE mod 1) interceptor also provides the system with a degree of capability over western Azerbaijan, although the Nagorno-Karabakh region remains just out of reach. Azerbaijan deploys two Favorit batteries and a single battle management complex. Each battery possesses a 30N6E2 (TOMB STONE) engagement radar and a 96L6E acquisition radar, with four 5P85TE2 TELs. The northern battery also possesses two 40V6 series mast assemblies adjacent to the two radar systems. The central position employs the 64N6E2 (BIG BIRD D) battle management radar. The southern site is emplaced on a reprofiled former S-75 (SA-2 GUIDELINE) position, with the northern site emplaced on a newly built semi-hardened position. The site buildup suggests a permanent deployment location. However, the mobility of the S-300PMU-2 allows it to redeploy in a very short period of time. The S-300PMU-2 represents the most advanced SAM system in the region, and is easily the most capable air defense system in the Azerbaijani inventory. The 200 kilometer engagement range is supported by 300 kilometer range surveillance and tracking capability from the associated 64N6E2 and 96L6E radars, systems capable of monitoring the bulk of both Azerbaijan and Nagorno-Karabakh. The six target engagement capability of the system, effectively doubled by deploying two batteries, effectively negates any aerial threat posed by the Armenian military. Furthermore, the ATBM capability of the system removes Soviet-era SCUD missiles from the threat picture. With the deployment of the S-300PMU-2, Azerbaijan has taken a significant step to upgrading its air defense capability. The ability of the Favorit, coupled with the state of the Armenian military, significantly reduces the threat of an armed conflict between the two nations in the future, or at the very least enables Azerbaijan to remove the Armenian air and missile threat from the equation. With all this in mind, I've still got a backlog of communications to get through regarding various things, so if you contacted me at one point and haven't heard back, I'll be getting to it. If you want to re-contact me, that's fine as well, it'll make sure you don't get lost in the shuffle. So. Who do I want to irritate today?